Hello everybody! Let’s feel and enjoy this beautiful spring together! Where’s the best place to enjoy the changing of the weather and the coming of the new season? For me, it’s my local farmer’s market. Last weekend, I stopped by the Union Square Farmer’s Market in New York City and found all kinds of beautiful, cute, and colorful early spring vegetables. Many of the local farmers were selling ramps, which are soft and tender only in the early spring. In Korea we call it sanmaneul, where “san” means mountain and “maneul” is garlic. Koreans enjoy it as a delicious seasonal mountain garlic that’s best when it’s young and soft. Combine soy sauce, vinegar, sugar in a small bowl. Mix well. Add onion, pepper, and sesame seeds and mix altogether. Set aside. Combine flour, chicken broth, and salt in a bowl. Mix it well until there are no lumps. Heat up a pan over medium high heat. Drizzle about 2 tablespoons vegetable oil into the pan and and swirl it around to spread. Lower the heat to medium. Pour 2/3 of the batter into the pan and spread it to a large, thin 12 inch pancake. Lay the ramps on the batter one by one. Drizzle the leftover third of the batter over the ramps. Add broccoli flowers over top. Let it cook for a few minutes until the bottom turns crispy. You should be able to hear a crispy sound when you shake the pan. Flip it over or turn it over with a spatula. Add more vegetable oil on the edge of the pan. Lift the pancake so that the oil reaches the center of the pancake. Press it down with the spatula and let it cook for another 3 to 4 minutes until crispy. Transfer to a large plate and serve hot with the pickle sauce. Posted on Friday, May 9th, 2014 at 5:03 pm. Last updated on October 6, 2014. Posted April 30th, 2017 at 4:11 pm | Log in to reply. This recipe made my afternoon! Had to get some ramps at the farmers market but wasn’t sure what to do with them at the time! This recipe saved the day! 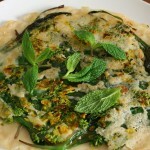 I think I might try making a potato pancake with the ramps next time. I sure would love to see a ramp kimchi recipe though! Posted May 28th, 2016 at 4:54 am | Log in to reply. I absolutely adore ramps and have at least ten favourite ramps recipes on rotation for the spring. 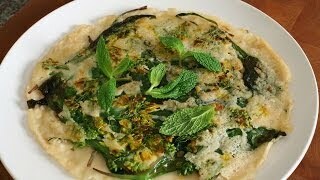 This year I’ve added the ramps pancake and it jumped straight to my top 3! It’s light and crispy, makes for a substantial and quick meal and, with the flowers, it’s an impressive and creative dish to share with friends. Do not skimp on the chicken broth, it really lifts up the flavours! Posted June 8th, 2014 at 10:14 am | Log in to reply. Posted May 12th, 2014 at 6:22 pm | Log in to reply. Posted May 13th, 2014 at 10:21 pm | Log in to reply. oh you made this with arugula! Great! This recipe was originally posted on May 9, 2014 at 5:03 pm by Maangchi. It was last updated on October 6, 2014. The video was watched 135,219 times on YouTube & has 2,353 likes!